In this post, we’re going to examine five steps involved in calculating ERP ROI to help ensure that your investment in ERP resources or ERP services is well-spent. The resulting quotient, expressed as a percentage, is your ERP ROI – the larger the quotient, the better the investment. However, the reality is a little more complicated than that because some of the costs and revenue streams are difficult to measure. Different departments and individuals might define costs and returns differently for an ERP project and interpret them differently. It’s important for the finance team to ensure the data collected and calculations across all departments are consistent. Two others factors that can clearly have an impact on ERP investment considerations – but that are not factored into the ROI calculation – are time and risk. For example, you may have two ERP investment options with the same ROI. However, one has a greater cost upfront with a longer payback, while the other offers costs spread out over time and payback beginning almost immediately. Clearly, the second option is a safer investment since any cost or revenue stream in the future is less predictable and therefore riskier. How sure are you of your projected costs? How far off into the future are the returns? The answers to questions like these can – and should – have a significant impact on your decision-making process. These go beyond just the vendor’s quote. Make sure you factor in any and all necessary modules – functions that are vital to, say, Marketing might not be given a second thought by Manufacturing. Planning a phased-in approach? Document all costs and account for the time value of money. Make sure you measure both costs and revenue over the same period of time. If you’re outsourcing your ERP as a subscription service, you still have to figure in the license fees and add up the monthly costs for the time period you plan on using it. Implementing an ERP system is a complicated undertaking and some amount of assistance from consultants will be required, along with significant internal resources. These costs should be estimated very conservatively as they are typically what drives most projects to go significantly over budget. To avoid “scope creep” and the budget-busting costs associated with it, it’s important to define the consultant’s scope-of-work and man-hour requirements as clearly as possible so you can calculate the cost as accurately as possible. Any scope changes must be documented in writing and approved by the project leaders. Training is critical for a successful ERP implementation and its cost should be included in your ROI calculations. Bringing workers in on overtime for training. Factor that in, too. And don’t forget to consider some temporary reduction in efficiency and output as workers get familiar with the new system and the financial impact of that. You initially decided to invest in ERP for a variety of reasons that required a new system. Now’s the time to start assigning returns to those requirements; for example, if an ERP system will enable more products to be made faster or with less manpower, what is this increase in production worth? Will better information enable Purchasing to establish longer-term, lower-price contracts with a rationalized set of vendors? Will customers experience increased customer service and responsiveness and increase their orders as a result? Will improved supply chain visibility allow better inventory control, enabling inventory reduction? What impact will the ERP have on every department? What’s all that worth? Potential returns that might not be obvious include the ability to automate processes. Not only can automation help keep production at peak performance, it may even enable you to reduce headcount and its associated costs. Evaluating and selecting an ERP system generates volumes of data. To accurately calculate your ERP ROI, it’s vital to connect the dots and correctly analyze all that data. That means building a team including members from all departments that will be interacting with the ERP system to ensure any input related to their area is relevant and accurate. Analysts from your finance department must coordinate all estimates of costs and returns and act objectively to ensure consistency and help counter any potential departmental biases. When you’ve reach this step, you’ve thoroughly estimated all your costs and returns for the ERP system. Your new ERP team has analyzed the data thoroughly and agreed everything is accurate. You’ve plugged those numbers into the ROI formula and calculated a quotient as a percentage. If it’s positive, you can expect a gain from your ERP investment; if it’s negative, you’ll have a loss. However, while the ROI calculation is simple, the input and data behind it is not. There are also the time and risk elements that we pointed out earlier that need to be factored in. 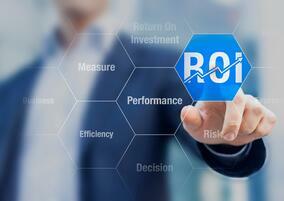 The true value of ERP ROI is really as a first-pass metric that should trigger further discussion in a larger context. Your company probably has several investments it’s considering that can affect revenue -- a new assembly line, supply chain improvements, IT infrastructure upgrades. If the ERP ROI exercise came back negative, chances are company resources will be better allocated to those other opportunities. But if the result is positive, there is a clear opportunity for making a good investment in ERP resources and it’s time to move to the next phase and more carefully weigh the investment options. Also, comparing ROIs to the cost of your firm’s capital will let you know which projects are worthwhile from an investment perspective. But, then there are also those subjective reasons that must be taken into account as well. Nevertheless, if you take the time and effort to develop accurate ROIs, your decision-making will be better informed, increasing your chances for greater success and profitability.